I got such good feedback from you all on the vintage finds I shared in my last post, I’m going to run with it! 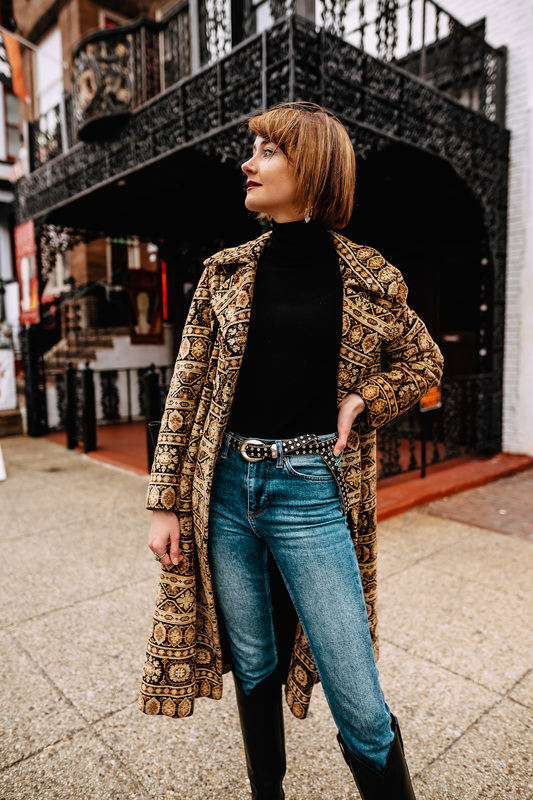 Coats are another great item to shop for in vintage and thrift stores. I can attest to this since the majority of my coats are vintage. Most of the time, they’re better quality and much warmer than the new stuff you’ll find for much higher prices. This gem was a score a Meadowsweet Mercantile on our recent trip to Philadelphia. 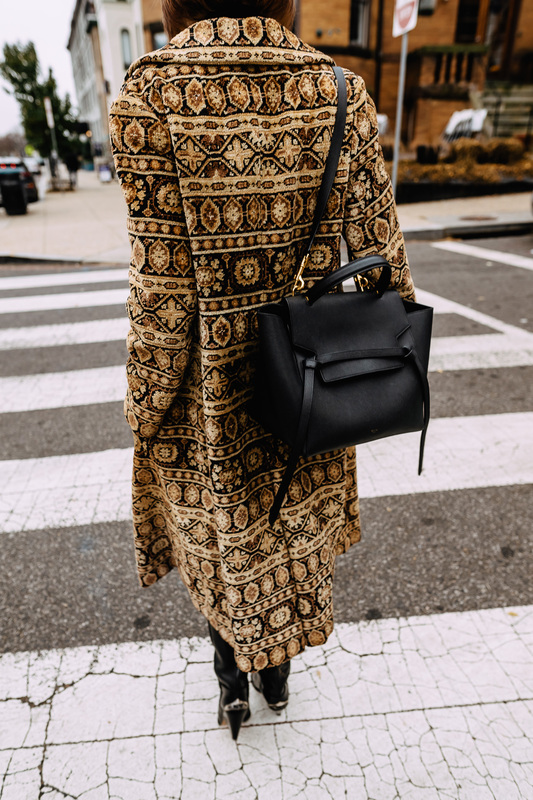 Honestly, there were a number of coats I wanted to take home, but I limited myself to just one and the incredible print on this tapestry coat ultimately won me over. If you’re looking to snag one of your own, try this very similar option, this full-collared piece, or this super cool hooded one. Look for wear and tear on the elbows and around the edges of the sleeves and lapels. Scour every inch for moth holes, especially on wool coats. If fur coats aren’t properly cared for, they start to shed. 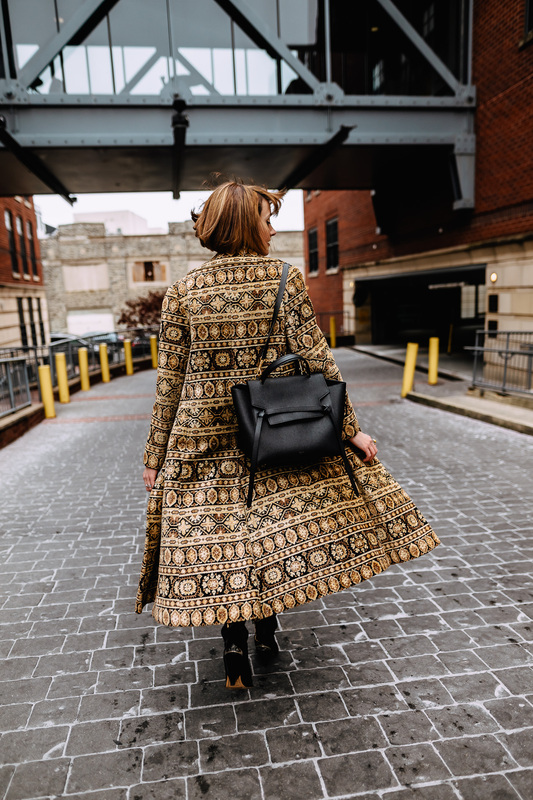 Give the coat a gentle rub to make sure hairs aren’t coming off before you purchase it. Believe me you don’t want a coat that makes you look like a crazy cat lady (not that there’s anything wrong with being a crazy cat lady! But I don’t think it’s anyone strives to look like one). Buttons can always be replaced and oftentimes it can make the coat look even better. Use your imagination! The coat I’m wearing above came with shiny black plastic buttons, a couple of which were missing, but I knew I could make the coat look fancier by replacing them with something better. A quick search on etsy brought up this shop with a great vintage button selection. Now it looks good as new! Easy to fix repairs like missing buttons or a torn lining are a great excuse to haggle! My experience is you can usually get the price down $20 or so for little fixes like this. Do you have anything you might add? 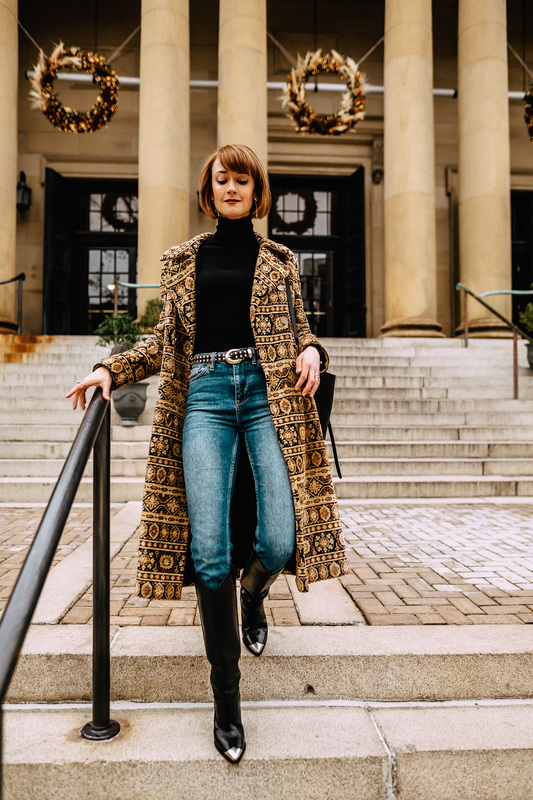 I’d love to hear your vintage shopping tips below! 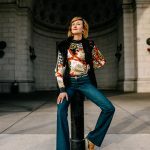 Photos shot by Pablo Raya in Adams Morgan. Wowwwwwwww!! That coat is amazinggggg!!! I love how you styled it too so it’s the star of the outfit. Now you have me wanting to look for a cool vintage coat! Oh my gossshhh my heart yearns for this coat LOL I just love everything about it! What a great find! I do skim before buying and i usually just drop it off at the dry cleaners. Your tips are awesome and I will definitely bookmark this for future reference. Thanks for sharing. Fyi, that coat and boots are gorgeous. I’m glad you thought they were helpful Lanise! Most of them were because of mistakes I’ve made in the past! These are such great tips! I love the buttons you added. That is a great one. I love the idea of changing buttons to something fancier. It’s super easy, too! I usually just take them to my dry cleaner to switch them out because they do a much better job of sewing them on than I do! Oh so pretty winter look!. The Vintage coat is cute and lovely. Such a creative idea to replace the missing buttons. Thanks for sharing. The vintage coat looks so cute. Such a creative idea to replace lost buttons. Thanks! What a unique find – beautifully worn. Changing up buttons is always a good trick. gorgeous outfit it looks amazing. That is such a beautiful coat! Thank you for sharing these tips! This year I’m trying to expand my vintage wardrobe. I love seeing your vintage finds! This coat is amazing. Thanks for the tips. I have also loved seeing you style these boots. That coat is completely stunning and it fits you so well! Thank you for this informative post. I love your idea of changing the buttons for creating a more stylish look. 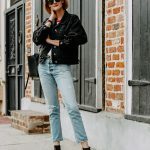 Great tips and I LOVE that coat! 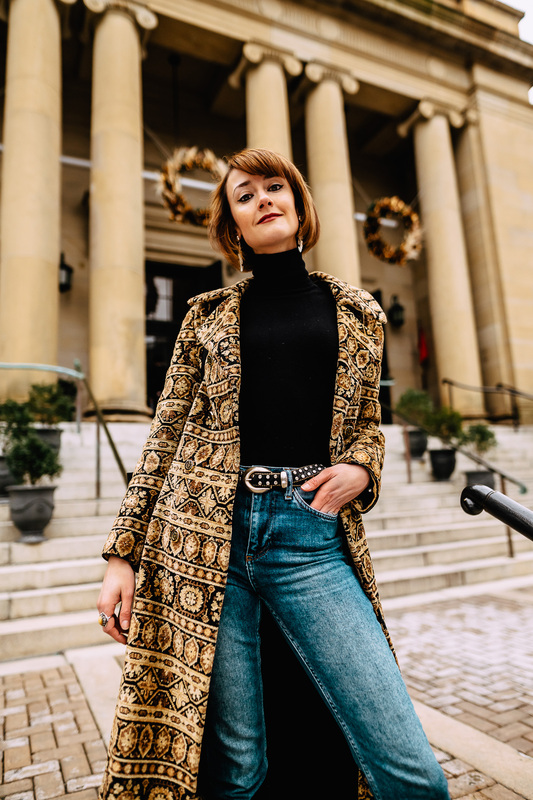 I’d love to add a vintage coat to my collection this season. That’s a gorgeous coat you got there dear! Absolutely love the classic style, so elegant.